We exchanged emails with many suggestions for the challenge but truth be told, who can resist this tart? I couldn’t, and didn’t. 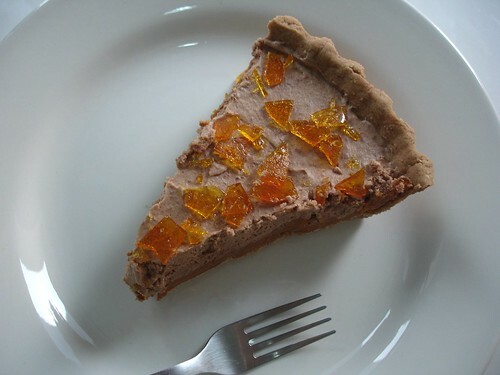 The tart is delicious, but not as rich as I thought it would be – the chocolate topping is very light and smooth. The caramel fragments add a delicious crunch to it and the shortbread base is so delicious I have been thinking of using baking the amount left on my freezer as cookies. I halved the entire recipe and got a 24cm round pie, with only a handful of pastry left. There’s also some info I need to share: I ended up using the metric system to measure some ingredients and cup/tablespoon/teaspoon to measure others because some of the measurements were a bit confusing in my opinion – for instance, I weighed 2 ½ tablespoons flour and got more than 15g. You’ll need to chill the pastry overnight, so plan accordingly. 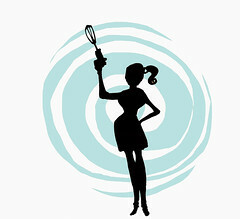 Don’t forget to check the other Daring Bakers’ tarts – there’s a link to the complete list on my side bar. In a mixing bowl of a food processor – I used my brand new Kitchen Aid, with the paddle attachment, yay!!! - cream the butter. Add the eggs, one by one, mixing constantly; sift in the flour, the baking powder, and the cocoa powder, and mix well. Form a ball with the dough, cover in plastic wrap, and chill overnight – take it out of the refrigerator a while before rolling it out, otherwise it will be too hard. Line the baking pan with the chocolate shortbread pastry (roll it between plastic pieces and it will be a lot easier) and bake blind for 15 minutes. In a saucepan, caramelize 200g granulated sugar using the dry method until it turns a golden caramel color. Incorporate the heavy cream or crème fraiche and then add butter. Mix thoroughly. Set aside to cool. In a mixing bowl, beat the whole eggs with the extra egg yolk, then incorporate the flour. Pour this into the cream-caramel mixture and mix thoroughly. Spread it out in the tart shell and bake for 15 minutes (I baked for 20). Remove from oven and allow to cool. Prepare the milk chocolate mousse: beat the whipping cream until stiff. Melt the milk chocolate in the microwave or in a bain-marie, and fold it gently into the whipped cream – I set the chocolate aside for a couple of minutes to cool because adding the warm chocolate to the whipped cream did not seem right to me. Pour the chocolate mousse over the cooled caramel mixture, smoothing it with a spatula. Chill for one hour in the refrigerator. If you have problems with the dry method, you may use this method. Set mixture in a pot over medium-high heat and stir slowly. When the mixture comes to a boil, stop stirring and leave it alone. Wait till desired color is attained. Proceed with the rest of the recipe. Melt 100g granulated sugar in a saucepan until it reaches an amber color. Pour it onto waxed paper laid out on a flat surface. Leave to cool. 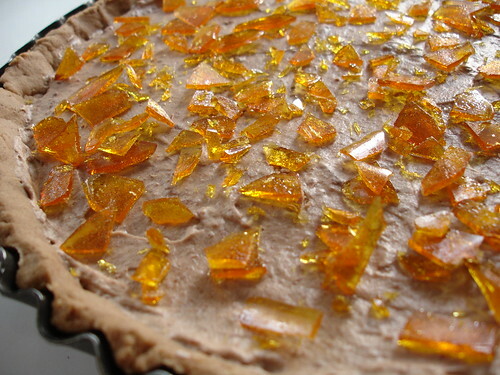 Break it into small fragments and stick them lightly into the top of the tart. I'm actually supposed to be joining the Daring Bakers list and have been emailing Ivonne back and forth but never got the announcement about this. Is it too late for me to participate now? Oh Patricia, what a magnificent tart! I'm glad you liked it. My problem was more with the milk chocolate I used. I'm definitely making this again. Thanks for agreeing to co-host with me! I love the "shards" on your tart top, Patricia. Thanks for hosting the event, and choosing this tart. The milk chocolate turned out lovely, and we're still enjoying it several days later, believe it or not! Good Choice! Oh, and thanks for a break on the difficulty factor. Your tart looks yum! I loved making this tart. This was my 1st challenge and it was a blast. Thanks so much for the tasty recipe! What a Lovely tart! I love how your caramel is nice and dark and your mousse so thick and light looking! Thanks for pairing with Veron for a wonderful challenge! We all (the family) loved the tart and I wish I had more now! Great Job! Patricia (and Veron) - I know this was only my third DB challenge, but it was my favourite one. I really liked the flavours, and am looking forward to making it again soon. I think it'd be perfect for Christmassy coffee night! I used the same plain/all-purpose flour I use for all my baking, and it worked just fine..
Wow ,chocolate and caramel, it is taste like heaven, beautiful picture of the tart, I bet the taste is wonderful,yummy. Your tart is beautiful! Thanks for co-hosting this month and for the challenge - it really was a challenge for me! Thanks for hosting DB this month and picking such a great recipe! I love the first shot of your tart, it's a sort of starry (sugary) sky! Looks great! I think we'll have to agree to disagree about the crust (hehe). :) Great job! Actually, Patricia, the fact that this is light and not overly rich makes it pretty appealing--a nice, sweet touch at the end of dinner without being too heavy. Sounds great! Thanks for the wonderful challenge Patricia :) I really enjoyed it. Thanks Patricia, a great challenge! And I love your starry tart! I love reading all of the Daring Baker entries....yours looks great! Nice decoration with the pieces of caramel shard. You and Veron picked a fabulous recipe! The caramel shards on top are great. I definitely feel like I missed out on not getting a big slice of this! Your tart looks great, Patricia. Thanks for a wonderful challenge, everybody loved it. The tart came out beautifully- I love seeing everyone's interpretations and I have to say, those shards of caramel on top really make yours shine. Nice work! 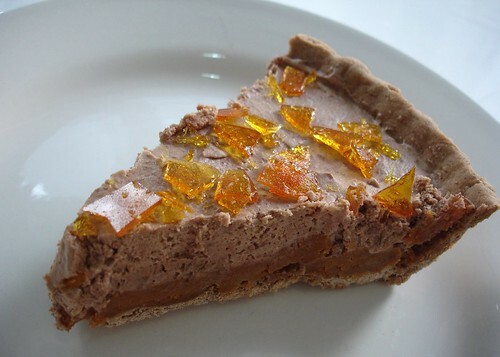 What a great idea to sprinkle caramel bits on top of your tart. Looks superb! Thank you so much for such a great challenge.. I really enjoyed this one! Oh, a new Kitchen Aid, how awesome! 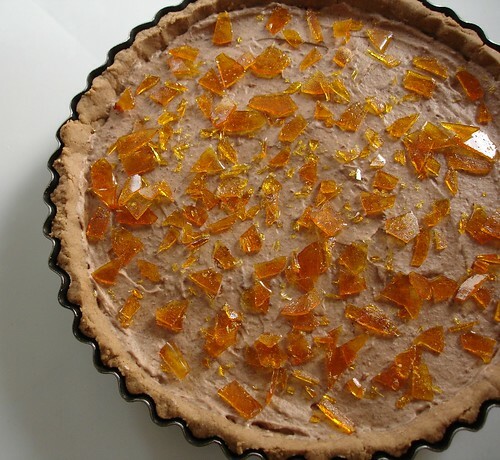 I think your tart looks beautiful with all the gorgeous shards on top :D. Thank you for hosting this, my first challenge! Gorgeous! I love the decoration design! Thanks for co-hosting such a great challenge! I really enjoyed the way this tart tastes. After looking at your beautiful pictures, I wish I hadn't given most of it away! I would love another slice! Thanks for hosting this challenge!!!! Quelle magnifique recette. La photo est superbe et me donne envie de le tester rapidement. Les bretonnes ADORENT le caramel au beurre salé. Hummm !! This looks devine... I love the chards of caramel! Thanks for a wonderful co-hosting Patricia! Wish I had used some caramel to act as diamonds on this cake. Lovely! Your tart looks so pretty with the caramel decorations! Thank you so much for hosting and for choosing such a delicious recipe. Your tips for metric measurements and cake flour substitution are a great idea. Beautiful job on the tart...way to pick a winner. Your tart looks gorgoeus :) It was a lovely choice for us all to make, yum! Thanks to you and Veron for a great recipe this month. I had a great time with it. Patricia, What a great tart. It looks beautiful and I'm sure it tastes amazing with all those great flavors together. Good job, Daring Baker! Thanks for choosing this recipe, I loved everything about it. Hi Patricia, Thank you for the challenge. It was a great one! Big hit with the children today. Also pleased to see your caramel was darker (as mine was too). I was starting to think I'd done something wrong. Your crust looks really neat too. As always, it's such fun to read of the adventures of the Daring Bakers. You and Veron selected a wonderful recipe, one I might actually maybe someday consider trying to make! lokks great! thanks for co-hosting...i had a great time with this one! Oh Pat, I agree that this tart is to die for! I really love it. :) Thanks for choosing an excellent theme. Thank you so much for hosting with Veronica! The tart was delicious and so elegant and definitely worth it! This looks really decadent. The Caramel Fragments look good, like pieces of stained glass. The Daring Bakers challenges sound fun and challenging. I didn't even think of laying the caramel fragments out like that. I love how your caramel hardened to the proper consistency. Perhaps if I make it again I'll use the wet method to make my caramel. Your tart looks so good... and I like the effect of the caramel shards. Wonderful tart Patricia. It was a bit too sweet for me but my family loved it. Thank you to you and Veronica for hosting. Your tart is gorgeous! The caramel pieces are lovely. I loved the crunch the caramel sugar added too. A gorgeous tart. Thanks for choosing a great challenge. It was a lot of fun. Patricia, that pie looks really yummy!!! I have awarded you the Nice Matters award over on my blog. Also have posted a thanks for the cannelloni recipe you did a few days ago. I posted my meat version. Thanks!!!! It was delicious!!! One of my favorite flavor combo's! This looks incredible. Butta Buns, I think you can join the group for the September challenge! Veron, it was a huge honor, sweetie! I thank you! Kelly, I'm so glad to hear that! Slush, I'm glad you liked it, especially being your first challenge! Dharm, you are far too kind, my friend! What an honor to have you on the group! Pille, your take on the recipe was fabulous, and thank you for sharing your opinion with us! Everything 4 Sweets, thank you, sweetie! Anita, you are so lovely, thank you! Leslie, it's OK! As long as we continue learning something from the challenges, it's fine! Anne, tks! Coming from an artist like you, this is quite a compliment! Hillary, thank you! I'm glad you stopped by to check it out! Bri, you did a fantastic job too, sweetie - but no surprise there! Marce, thank you, my dear friend. Hannah, tks, darling! I'm glad that most of the DBs liked the challenge. Lis, my dear friend, you are far too kind! Jen, I was so excited to use it for the first time, and it was a lovely way to start! Sher, your tarts looked beautiful and you had your hands full, sweetie! Tks for participating! Chrystel, I'm sorry, but I don't understand everything you wrote. Elle, thank you, sweetie! I'm glad things worked out even with the measurement issues. Peabody, thank you - I'm glad to hear that. Dagmar, gotta check your post! Kelly-Jane, I'm glad you feel this way! Mary, you did a wonderful job - as usual! Inne, thank you for your lovely words. Karin, but that's one of the nice things about the DBs - we have to handle all those differences. Amanda, gotta check your tart, sweetie! I'm glad to hear the kids enjoyed it. I have been making caramel since I was 13, so that is not an issue for me. And I always make it dark, but carefully not to burn it - it gets so bitter! Steph, great to hear that. Anh, your photos are STUNNING!! Kevin, they are! The group is wonderful. Hilda, I used the dry method - it the only one I have ever used. Ge, I loved your tart! Barbara, I'm so happy that you are part of the group. Amy, I'm off to see yours! KJ, I liked making it, too, tks! Pat, thank you for being such a dear! I'm honored! Jeanne, the group is full of talented people! - My dear Patricia, if it wasn't for you and Veronica, I don'y think I would ever tried baking with milk chocolate and caramel. Thanks for this challenge and your tart looks perfect. Looks good Patricia, the crackly caramel topping reminds me of creme` brulee. All that shattered caramel on tops represents my will power to resist the caramel. Thanks for not resisting this one Patricia, it is a lovely tart and yours is gorgeous. You two chose very well for the challenge! I won't make it again, but I am happy that I gave it a try. I often use that substitution for cake flour just so I don't have to buy any at the store. This time I already had some though. Pat, you and Veron made a great choice. As I only made the base I can only commnet on it.it was great. I love cinamon and just adored its beautiful scent. 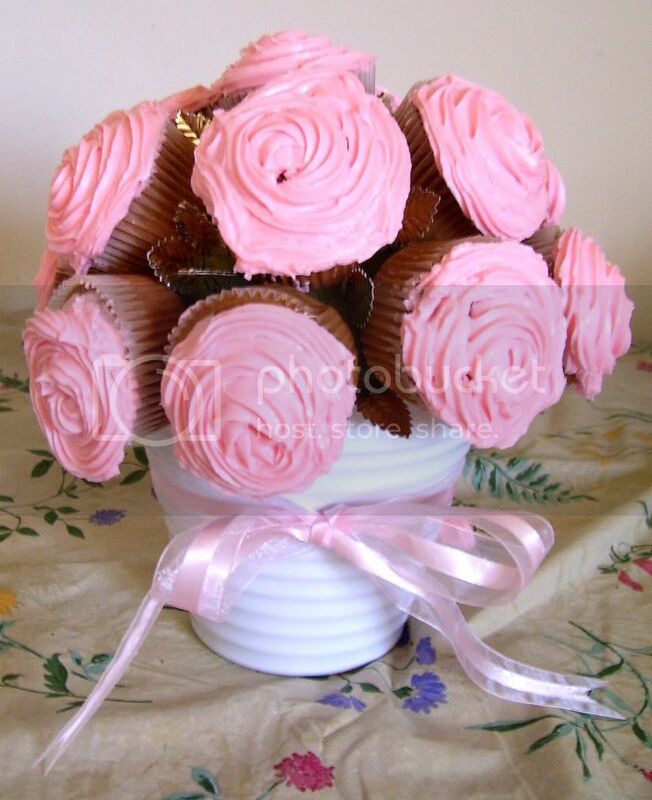 I love the way you presented yours - really beautiful.Mouth watering!! Hi Patricia, did you have fun hosting this month's DB challenge? Eva and I are thinking of joining DB when she gets back from Germany. Your tart looks so tempting. I like the caramel bits on top. Have a lovely weekend. Pretty pictures! You're so ingenious to come up with a cake flour substitute -- it's such a commitment to the rules. Thanks so much for hosting! Delicious!!! Yours turned out SO good!!! Stunning and delicious. What an excellent choice you made for the group. 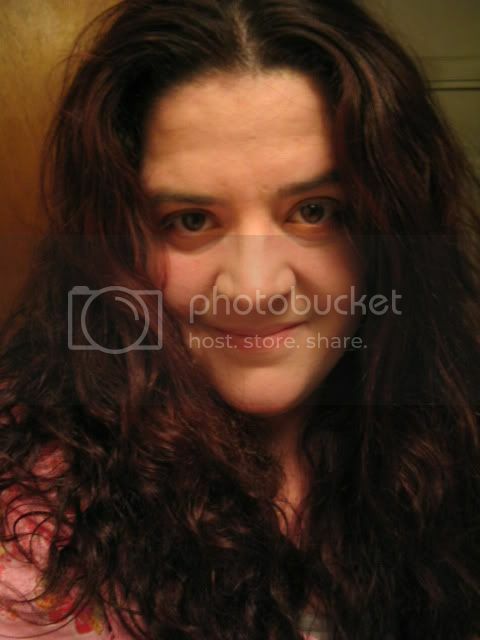 Patricia, thank you so much for hosting the August challenge. I had so much fun (despite some flukes initially). By the way, love your glassy-looking sugar art decorations! Ciao! I always admire the Daring Baker Challenges and this tart is just gorgeous! Patricia, what a fabulous job you did here - I love the way you decided to garnish it, and I love milk chocolate in baking! Hey Patricia, you think your dad might like this? 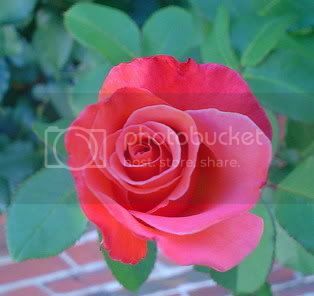 Rose, my dear friend, I was thrilled with your post! Tanna, you are far too kind, sweetie! Sara, I'm glad you did! Jenny, it worked fine for me and thank you for letting me know it works fine for you, too! I think the group will be even more talented with you both. Kirsten, if I lived nearby I'd bake loads of delicious things for you, sweetie! Dayna, thank you! I'm glad to hear your opinion about the recipe. Erika, I hope you join us! 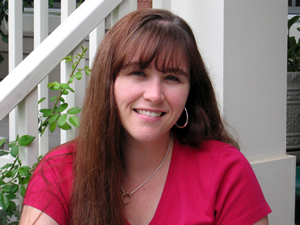 Maria, I loved reading your post, sweetie! Ciao! Cynthia, he's not into chocolate, but he would certainly love the caramel filling. it looks incredible! congrats, Patricia. Thanks for a great challenge!!! Your tart looks lovely! Yum I love the little caramel fragments on top. Your tart looks delicious! Your tart looks so pretty! Thanks for choosing such a delicious challenge for us!! Thank you for the time and effort you put into hosting this challenge. It's a gorgeous dessert and it clearly stretched people's boundaries. Looking forward to trying it myself this week. Patricia, you did such a lovely job hosting AND your tart is fantastic looking!! YEA!!! Great job!!! 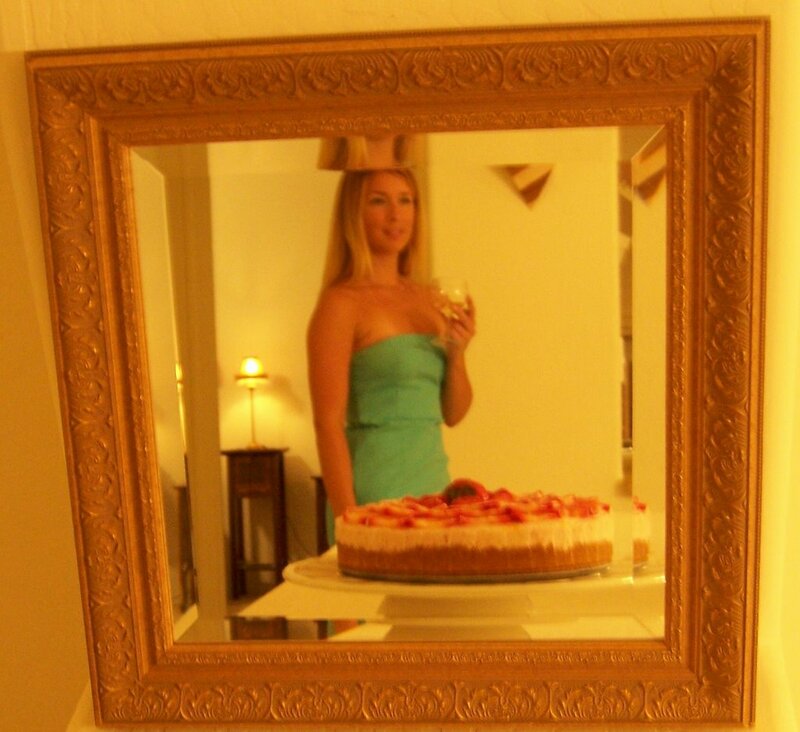 Dear Carmellina, thank you for letting me know about the tart - and I'm glad to know you're enjoying the blog!